"I have been using this recipe for special occasions, holiday meals, or when I really want to impress somebody. I always get lots of compliments and requests for the recipe." Preheat oven to 350 degrees F (175 degrees C). Arrange potatoes on a baking sheet. Bake potatoes in the preheated oven until tender, about 1 hour. Melt 2 tablespoons butter in small pot over medium heat. Add green onions; cook until soft, about 4 minutes. Stir in flour until well blended, about 1 minute. Pour in milk and 1/2 cup half-and-half gradually, stirring sauce constantly. Season with salt and cook until sauce is thickened, 10 to 15 minutes. Cut a slice from the top of each baked potato and scoop the pulp into a bowl. Mash pulp until no lumps remain. Add 1/4 cup half-and-half and 1 tablespoon butter; blend together with an electric mixer. Stir in 1/2 cup Parmesan cheese and pepper until fully combined. 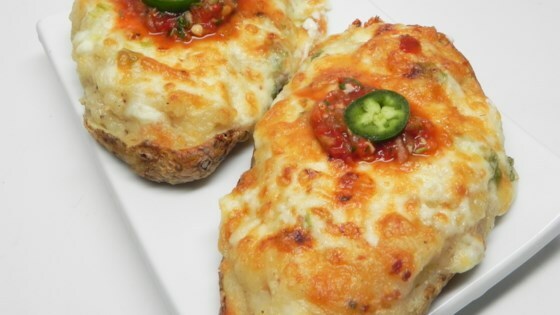 Fill baked potato skins with the mashed pulp mixture; make a well on top of each potato. Fill wells with onion sauce. Sprinkle 1/4 cup Parmesan cheese on top. Turn on the broiler. Return stuffed potatoes to the oven and broil until golden brown; about 15 minutes. You can substitute the Parmesan cheese with pepper Jack cheese or mozzarella cheese. The onion sauce may be cooked just before potatoes are done or while they are cooling (before scooping out pulp). Instead of broiling in the last step, you can just let the potatoes heat up for 15 minutes in the still-warm oven.